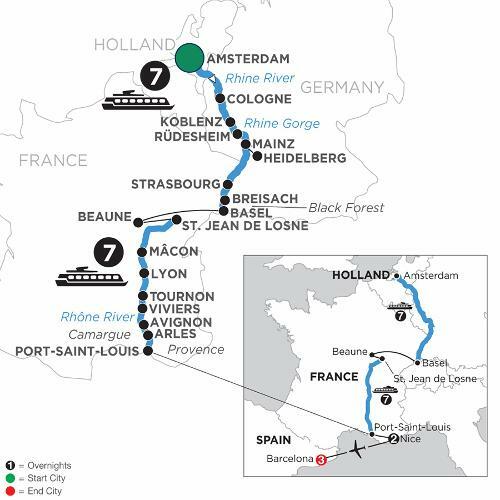 This mesmerizing river cruise and European vacation begins on the Rhine River and then continues on the Saône and Rhône Rivers. Enjoy a canal cruise in splendid Amsterdam, as well as guided sightseeing in Cologne, Koblenz, and Strasbourg. Delight in excursions to Germany’s Black Forest and to Heidelberg—Germany’s oldest university town with its imposing castle. Also, sail through the dramatic Rhine Gorge, see the legendary Lorelei rock, and visit the Gutenberg Museum in Mainz. A motorcoach transfer takes you into France’s Burgundy region to fascinating Beaune for a visit to Hôtel-Dieu. Next, board your ship in quaint St. Jean de Losne and set sail for Macon, France’s gastronomic capital of Lyon, as well as medieval Tournon, charming Viviers, Avignon, and Arles. Sail through the peaceful Camargue area to Port-Saint-Louis. Disembark your river cruise ship and transfer to Nice for your final two nights in France. Here, you’ll walk through the Old Town and the Promenade des Anglais, Nice’s most famous boulevard. In your free time, perhaps take an excursion to Monaco, St. Tropez, or Cannes—known for its famous film festival. Fly from Nice to Barcelona, where you’ll enjoy guided sightseeing, including Passeig de Gràcia, La Pedrera, and inside visits Gaudi’s Casa Batlló, and Sagrada Familia Basilica and relaxing free time—all part of your Monograms vacation package in Spain. At your service is an expert Monograms Local Host® who is available to you throughout your stay in Nice and Barcelona. A mixture of French landscapes, cuisine, and iconic sights, adding some spice and flavor of the colorful city of Barcelona, your scenic river cruise through France and vacation package in Spain make the perfect recipe for a European getaway.